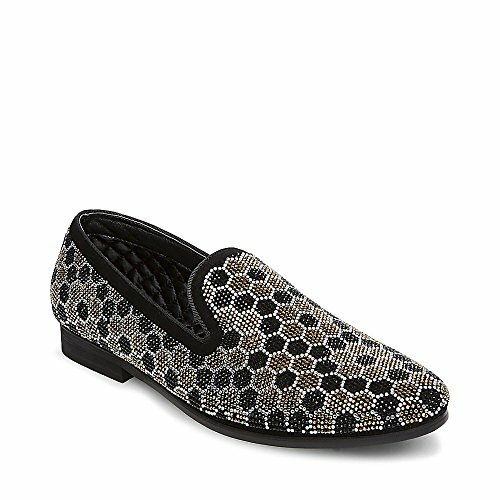 Steve Madden Men's Caspian Loafer, Black/Gold, 8 M US by Steve Madden at SCRHI. MPN: CASP01M1-366-8 M US. Hurry! Limited time offer. Offer valid only while supplies last. With a leisurely slipper silhouette and glitzy rhinestone-covered surfaces, our new caspian loafer turns any ensemble into a luxe fashion statement! With a leisurely slipper silhouette and glitzy rhinestone-covered surfaces, our new caspian loafer turns any ensemble into a luxe fashion statement! while flashy embellishment forms a lively honeycomb motif on the styles exterior, quilted satin lining ensures a feel that’s equally opulent.